“Fierce and Fragile: Big Cats in the Art of Robert Dallet” (through March 13) at the Bruce Museum in Greenwich features 60 paintings, drawings and sketches by the man who created 25 scarves for Hermès. 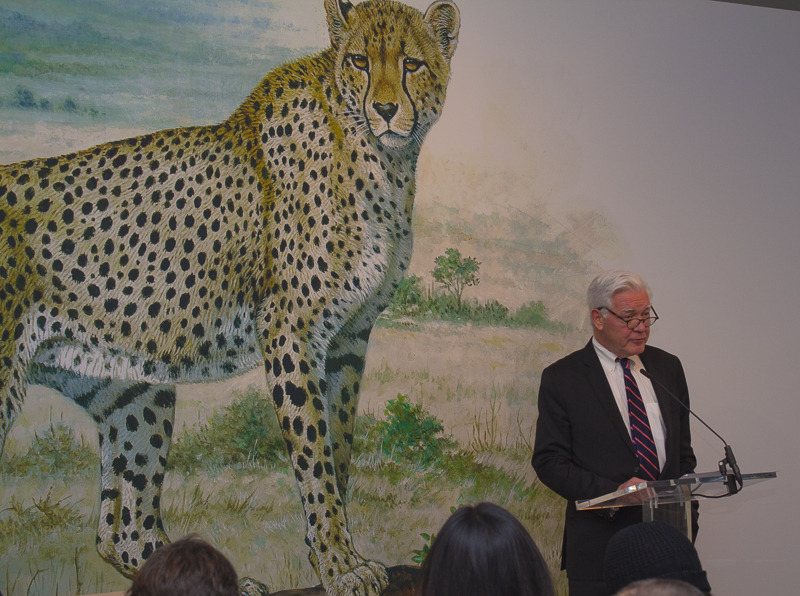 This exhibition was born through mutual admiration of the artist, Robert Dallet, and a shared love of big cats by Pierre-Alexis Dumas, Hermès artistic director, and Thomas. S Kaplan, founder of Panthera, the global wild cat conservation organization. Robert Dallet, who did not have the recognition he should have in his lifetime, devoted much of his life to the study and observation of big cats, focusing on eight species: tigers, lions, leopards, cheetahs, cougars or pumas, jaguars, snow leopards, and the clouded leopard. Dallet’s passion as a wildlife naturalist, the exhibition offers an in-depth look at the science and biology of the big cats while examining the conservation challenges the animals face today. Thanks to a collaboration between the Bruce Museum and Hermès of Paris, general admission will be free from January 10 – March 13, 2016, during regular gallery hours. By waiving admissions, the Bruce and Hermès illustrate their commitment to the understanding and appreciation of art and science to a greater audience. Robert Dallet was a great man who had a special gift to share, a man who could directly connect his eye to his hand. He could draw freely and prolifically from the imagination. He had assimilated the full anatomy of the animals he depicted. It was unbearable to him that so many species were disappearing in his own lifetime. This is a memorable and exquisite exhibit that makes us ponder the gifts and treasures that nature gives us. In these beautifully composed paintings and drawings we explore the little-known genius of the artist, now available to a worldwide audience on the tenth anniversary of his death. In the words of the late Robert Dallet lies the essence of what you will view. “I have painted them (big cats) to pay homage to their beauty, and compel you to share my passion, which is my reason to live. I hope that these depictions will not be the only memories of a fascinating world lost to mankind’s recklessness.” What a fascinating and rich life he must have lived. Hermès is selling a beautiful rendering of Dallet’s illustration on a scarf, 36″ silk, and a 55″ luxurious cashmere one, in over 300 of their stores worldwide. Proceeds go to the Panthera conservation of big cats in the world today. This exhibition will launch at the Bruce Museum and is scheduled for an international tour throughout Europe and Asia in 2016 – 2017. Meet Carole Alexis, Director of Ballet des Amériques. What Makes Her Tick?